I graduated in July 2013 with an undergraduate degree in Maths and Economics from LSE. During university, I did several small work experience placements and shadowing to get experience, because these days it’s quite difficult to get enough to put on job applications in order to stand out from the crowd. I recommend looking for experience in unusual places. My dad suggested volunteering at the Royal Society for the Protection of Birds (RSPB) and over summer in first year I helped with some of their data analysis. I learned a lot about working in a team and coordinating that side of the project work, and it helped my data analysis skills as well. That was really useful experience to talk about in my future interviews. Also at university, I did a three-month summer placement in my second year with the Government Economic Service at the Department of Energy and Climate Change. It opened my eyes to the benefits of working in Government as an economist: it was incredibly interesting work and people were so friendly and supportive around the office. After graduation, I took that summer off to travel. If you are lucky enough to have the opportunity to take a couple of months off and experience some of the world before you get into full-time work, you should definitely take it. It’s great to have a bit of a break and it’s one of the best chances you’re going to get before you get stuck into your career. I wish I’d gone for longer! I started at ONS at the end of 2013 and since then I’ve worked on a number of different projects. The idea in the Civil Service Fast Stream is that you rotate around teams quite frequently, so I’ve had a number of different projects that I’ve been involved in. One of the main successes I’ve had is co-authoring an article which calculated inflation rates for different sub groups of the population, so looking at retired households, households with children, less affluent households, richer households – the whole spectrum. It was brilliant to be involved in – it was detailed analysis, and it’s since been used as a reference point for developing a new method of calculating inflation. Coming from university three years ago, I certainly didn’t expect I’d be able to get this far so soon. One of the reasons I really enjoy working here is that you’re surrounded by such a wide range of people from so many different backgrounds, who are all so enthusiastic about their jobs. Having diverse teams is something the office is looking at closely, so we’re also trying to recruit more people – not just economists, but other analysts such as data scientists and statisticians, to digital professionals that can help develop new products alongside our new website. On a day-to-day basis, my role is incredibly varied. We’ve got a strong economist community here at ONS, so there are lots of talks and events that we organise together. For instance, we’ve recently started up a debate series where we can discuss topical issues. Another highlight was a three-week secondment I completed at ITN in London before the general election in 2015. I was particularly interested in how the media use our economic statistics. So I worked with ITV to see how they put together their news updates and I also worked with Channel 4 to see how our data was used on their website in their FactCheck blog. It was such a good experience – I was able to watch some of the actual news broadcasts from inside the control room! It was fantastic to see the value they put on ONS statistics too. It’s always nice to know your work is appreciated as being dependable and trustworthy. Especially with the FactCheck blog, it was good to see that they felt they could give our data out to voters in advance of the general election as an independent source of evidence. Another one of my previous roles was working on the Economic Review, which is a monthly article providing analysis on many of the ONS economic statistics. There’s an unacknowledged competition within the team to produce the most interesting graphs and to tell the most interesting narrative for the readers. People would gather round your desk to see how you put the graph together and learn from it: it’s a great, supportive environment. The best presentations I’ve seen always have three key points, or three main messages to take away, so I’ll try to emulate that and give you three points of advice! The first thing came from John Pullinger, our National Statistician. He gave a talk when I first joined ONS in which he said especially in the early stage of your career, or if you’re at university and just starting out, just say ‘yes’ to every opportunity. The second point is to just have confidence in yourself. Don’t let yourself be pigeon-holed. If there’s something that you want to do then just go for it. Don’t let anyone else’s perceptions hold you back. And thirdly, and perhaps controversially for some, my advice is don’t feel like you have to work in London. I spent three years there at university and there are lots of opportunities, but don’t have that as your be all and end all. There is so much to discover elsewhere in the UK. 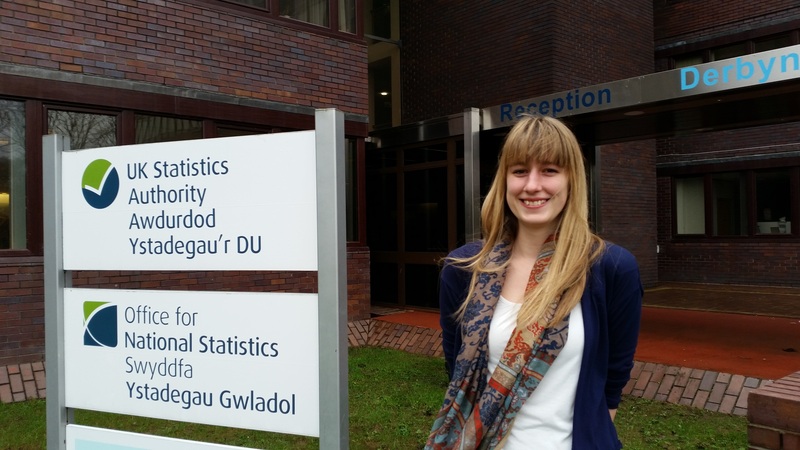 Here in Newport for example, we’re developing as the hub of statistical excellence for the UK. There really are so many other opportunities around the area as well in terms of other government departments. The Fast Stream recruitment process can be quite daunting, but there’s a lot of support out there and it is worth it because it’s such a good job. There are two assessment centres for assistant economists. You have to do the Economist Assessment Centre (EAC), which tests you on your economics skills, and then the Fast Stream Assessment Centre (FSAC), which is more about general skills like management, teamwork and communication. If you do some Google-ing, there’s a number of websites out there that have information on what kind of exercises come up during these assessment centres. There are also lots of other options out there if you’re not successful at passing the Fast Stream first time. For example, if you pass the EAC but don’t quite make the grade on the FSAC, you can be taken on as a provisional economist. Last year, ONS hired around 15 provisionals and supported them through their application to the Fast Stream at the next given opportunity. From that 15, the majority were successful and continue to work at ONS or at other government departments. Also, if you miss the deadline for the Fast Stream (it’s only run twice a year), ONS does a direct recruitment scheme for economists as well. Again, that’s a fantastic opportunity for graduates to secure a graduate level job on a two-year contract, and the ONS supports you through your application to get on to the Fast Stream. We’re running another direct recruitment round later on this year. It will be advertised on the Civil Service Jobs website and we’ll also be going round some of the university careers fairs to talk about the vacancies as well, so keep an eye out for that!